A seventh-grade counselor escorts me through the A. Mario Loiederman Middle School for the Arts in Silver Spring, Maryland, a suburb of Washington, DC. We pass a student wearing a “Loiederman Lions” T-shirt. There are posters, corkboards, and lanyards bearing my last name, with its odd jumble of vowels, a name that some friends still can’t spell. The counselor takes me to a classroom where seventh-graders are whiling away this last day of school. One student’s face lights up. “You the dude in the painting?” He’s talking about the portrait of my brother in the office. “No,” I tell him. “I’m that dude’s younger brother.” The school is named in honor of my brother, who passed away in late 2001, and I’ve come for the school’s eighth-grade graduation ceremony. My brother, Mario, was a prominent civil engineer and entrepreneur who started a consulting firm, which grew into one of the most successful in Montgomery County. He was on the board of artistic and service organizations, helped found and fund cultural and civic groups, and was Chairman of the Maryland State Arts Council. I wonder, as I look at the students, whether they know that it was because of Mario that the US government discovered we were here illegally; that it was because of him that the government ordered us to be deported. In 1891, my ancestors left their homes in Russia and boarded ships to Buenos Aires. The passage was subsidized by Baron Maurice de Hirsch, heir of a wealthy Jewish banking family. After de Hirsch’s only child died in 1887, his philanthropic activities became the focus of his life. Above all, de Hirsch wanted to relieve the suffering of millions of Russian Jews by sending them to the New World, where he would pay for them to become farmers. He founded the Jewish Colonization Association (JCA), which bought more than a dozen large parcels of land in different parts of Argentina. One of these was the Colonia Mauricio—named for de Hirsch—200 miles west of Buenos Aires. The colonists arrived full of hope but were soon overwhelmed by reality: they’d been plunked down in a place where they didn’t speak the language; where they dressed, behaved and prayed differently; where the JCA was rarely available to help; and where they were forced to live in tents, subject to mosquitoes, disease, and extreme weather. While I was growing up, my parents talked about their childhood in the Argentine pampas: Mamá told stories about her favorite cow falling into a ditch. Papá recalled his camaraderie with the tough, nomadic gauchos, as iconic a figure in the South American imagination as the cowboy in North America. Eventually, many years later, I visited Carlos Casares, the Argentine town near the Jewish farming colony where both my parents were born. It houses a historical archive with documents and photos, and the archive’s director helped me create a family tree. I learned that Jacobo Toker, my maternal grandfather, married Esperanza Hoijberg in 1895. He was 28, my grandmother 14. She showed me a listing for my paternal grandfather, one of the founders of the Colonia Mauricio. 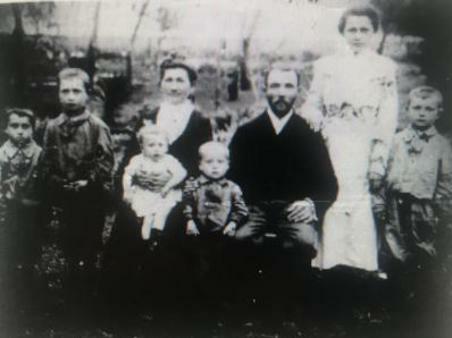 There was a wonderful photograph, taken in 1903, when Papá was two-years-old: my grandparents and their six children stare at the camera. Trees and farm implements fill in the background. My grandparents and their children, including my father, are all wearing their best clothes, not their work clothes. They stare stone-faced, unsmilingly, at the camera. My grandfather and the boys have their shirts buttoned at collar, my grandmother and the girls wear dresses. Before leaving, I bought a book by Marcos Alpersohn, a colonist, who recounted local history. Published in 1922 in Yiddish, it was translated into Spanish in 1991. In Chapter 32, I found the following narrative: In January 1893, there was a gathering of all the people of Colonia Mauricio, a gripe session. After more than a year of relentless hardships, many of the colonists had had enough. Desperate questions flew back and forth: Why hasn’t the new doctor arrived? Why hasn’t the JCA built a ritual bath yet? When will the men’s families arrive? Avrum Hoijberg… the name rang a bell. I looked up the family tree, and there he was: Avrum Hoijberg from Odessa. My great-grandfather. My mother’s mother’s father: the tall, robust ex-soldier from Odessa who turned a toxic moment around, who danced in the face of his friends’ pessimism, who reminded them why they had left czarist Russia, and who made them understand that they were already home. What is home after all? With enough of what Argentines call polenta—grit, perseverance—just about any place where you’ve started a new life can become home. Even a remote farming colony in the pampas. Papá was born in the Argentine pampas in 1901. By the time he was 13, both his parents had died, so he went to live with his oldest sister, Sara, who was already married and living in Buenos Aires. Papá was blond, blue-eyed, athletic, and fascinated by weapons. He went to military school, where he thrived. He was a popular student who became captain of the soccer team. After graduation, rather than go into the army, he chose to work for the Argentine government as an arms expert, buying weapons for the military. In 1923, when he was 22 years old, he was sent to Hartford, Connecticut as a member of an arms-buying mission. Mamá was born in 1905 in the same Jewish farming colony where my father was born. By 1917 her family had failed at farming, and her parents, now with eight children, decided to try their fortunes in the US. The four oldest children chose to stay in Latin America, and Mamá, at 12, was the oldest of the four kids my grandparents brought to the US. Once settled in Baltimore, Mamá quickly became American: I have pictures of her as a teenage flapper in the 1920s. By 1929 both of my parents were living in the US, unaware of each other’s existence: Papá was in Connecticut, working for the Argentine government; Mamá was living and working in Baltimore at a time when few cared about your immigration status, especially if—like Mamá—you were young, smart, and spoke English without an accent. In mid-1929 both my parents happened to go to the Argentine Consulate in Washington within days of each other, and the sharp-eyed Argentine Consul spotted the odd fact that a man of 28 and a woman of 24 were both from the same small town in the Pampas, living in the US, and single. He connected them. Once my parents met, they realized that their families knew one another. More than that, it was almost certain that my father’s father, who acted as a Justice of the Peace, had conducted the wedding ceremony of my mother’s parents. Call it kismet or b’shert: five months later, November 27, 1929, my parents got married in Washington, DC, with the Argentine Consul present. Not too long after, Papá was assigned to Dordrecht, Holland, where he was part of a mission buying weapons for the Argentine military. In 1931 his group was sent to Le Havre, France. Mamá often told me about the pro-Nazi sympathies of the other Argentines in the weapons-buying delegation: though these Argentines didn’t know German, they were enthralled by Hitler’s radio speeches. Mamá, who knew Yiddish, was the only one who realized what he was saying. She urged my father to arrange for them to leave Europe. When Mamá got pregnant with my older brother in 1934, my parents returned to Argentina, traveling from Europe on the SS Ile de France. The photos show a stylish couple, at ease aboard one of the world’s finest ocean liners. Back in Buenos Aires, Papá worked at the War Ministry while Mamá gave birth to my brother Mario in 1934, and to me in 1940. In the early 1940s we lived in a handsome, roomy apartment in the picturesque San Telmo district. My parents regularly went to the opera at Teatro Colón, always wore the latest fashions, and danced the tango in nightclubs. Nearly every day, María, our live-in maid, would take me to Parque Lezama, the park across the street. Then, in 1945, Perón came to power. As a teen in military school, Papá had known Perón, who was a fencing teacher at the academy, and my father despised the man who would become dictator. Once Perón was in power, Papá lost his government position. For the next two years, while unemployed, Papá struggled to get a visa to the US. Instead of an immigrant visa, what Papá got was a letter from a family friend, a man who owned a candy factory. The letter said Papá would be representing that man’s candy business in the US. 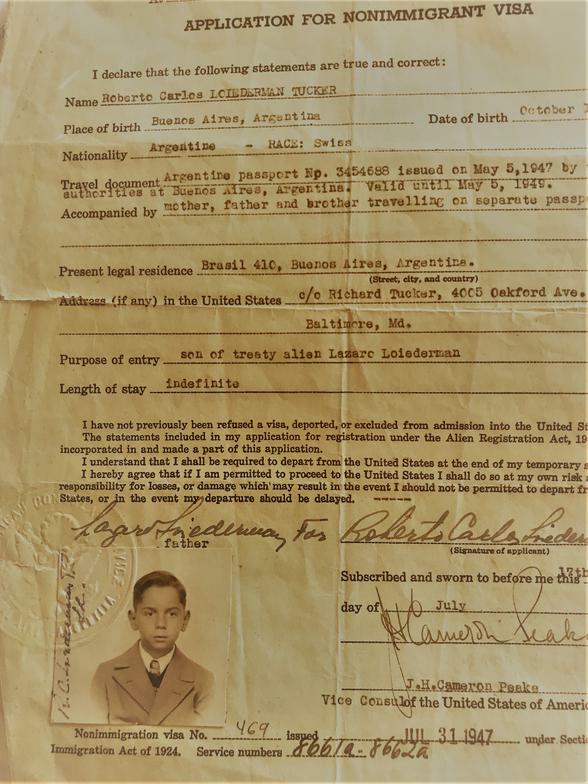 On July 17, 1947, three months before my seventh birthday, we were in the US consulate in Buenos Aires. Papá was given a two-year business visa to the US, and Mamá, Mario and I were also given temporary nonimmigrant visas. My visa document, which I’m looking at now, decades after these events, is yellowed and frayed. On the bottom left there’s a pasted-on passport photo: an unsmiling first-grader dressed in a child’s suit jacket with wide lapel; a sweater, a white shirt buttoned to the collar and a tie are underneath. My hair is freshly-cut and slicked down and I’m looking off to the side. In the photo, my arms dissolve into the gray background and there is a US seal in the top left. Disturbingly, it looks like one of those haunting World War II photos from a museum display: a displaced child escaping political danger and facing an uncertain, perhaps tragic future. After we left the US consulate, visas safely in hand, Papá contacted a friend at a shipping line and arranged passage for the four of us on the SS Montevideo, a Norwegian-flag cargo ship scheduled to leave Buenos Aires at the end of August. In the weeks leading up to embarkation, Mamá tried to prepare me for the US by teaching me to pronounce “banana” the American way, which sounded like buh-nuh-nuh, mouth almost closed. No matter how much she insisted, I couldn’t stop saying it the Spanish way, as I’d always done: bah-nah-nah, with mouth wide open, teeth exposed. The more she repeated buh-nuh-nuh, the more I kept saying bah-nah-nah. After too many frustrating attempts, Mamá eyed me with mock-anger: “You’re not my son,” she said, shaking her head. “You’re María’s son.” This was nonsense, of course: it’s what Mamá often said when I misbehaved. María, our live-in housekeeper, who’d been with us since before I was born, had always taken care of me. She’d fed me, taught me to memorize stanzas from Martín Fierro, and played with me in Parque Lezama, the hilly, tree-lined park across the street. Oddly, I was pleased by Mamá’s joke that María was my mother. After all, she had endless patience with me, like the time I went up on the roof of our building and floated paper missiles with the message “Death to Perón.” María went down to Brasil Street, carefully picked up the paper airplanes one by one, put them in the incinerator, then made me some hot cocoa. I wasn’t upset about leaving Argentina, but I knew I’d miss María, whose skin was more lined and darker than Mamá’s, and whose ample body had held me close when Mamá was angry with me, or when Mario—who thought of himself as a third parent—hadn’t stood by me. During our last week in Argentina, Mamá and Papá found time on July 19th, Mamá’s 42nd birthday, to go to the Teatro Colón to see Carmen, as if they were saying good-bye not only to their family and friends, but also to the buildings and institutions they loved. They were still in the clothes they’d worn when they went out earlier that evening: Mamá in a dress she bought in France when Papá’s arms-buying mission was stationed there, Papá in a suit made-to-order from Holland, where they lived and worked during the fateful pre-war 1930s. Finally, after much cajoling, Mamá gave in. They danced. At first, she simply went along with it, but Papá’s touches on her back guided her steps. As they danced, I could see that Mamá was crying, and the song choked me with pain too, something I hadn’t felt before. I suddenly realized we were leaving Argentina, perhaps forever. On August 25, 1947 we boarded the SS Montevideo at the port of Buenos Aires. We took little with us, having relinquished furniture, dishes, and silverware to relatives. My parents brought a few nostalgic items, like the metal-rimmed gourd from which they drank yerba mate. Once we were aboard the Montevideo, Mamá scrunched her face in disgust, reacting to the odd mixture of smells. But to me it was pleasant: motor oil, salt, rust, grease, acrid smoke from the stack, and rope chafing on metal. Solid and squat, the Montevideo, its holds loaded with wheat and soybeans from the pampas, would be my home for the next month. I was certain this was going to be an adventure with pirates and storms and swordfights, just like in the movies. Mamá guided me into a room and said the four of us would be sleeping and living here. The four of us in one little room? Papá raised and then lowered his chin, his gesture for accepting the inevitable: “Así es, pibe.” That’s the way it is, kid. Later that day, as it was getting dark, the Montevideo left port and headed east-southeast toward the Atlantic Ocean: a chilly winter evening at sea. Our room was on the mates’ deck and we put on coats and went outside to watch the lights of Buenos Aires get dimmer. Soon, in the other direction, we saw the nimbus of lights from the city of Montevideo, where our family had spent several summers with Mamá’s older brother Manuel and his family. I could taste the steamed panchos, hot dogs, lovingly wrapped in buns, sold on the beach, slathered with a mix of ketchup and mayo, greasy, juicy, delicious. Seventy years later, I can still taste and smell them. Thirty days after leaving Argentina, we arrived at the Port of New York. There it was: The Statue of Liberty. We got our passports stamped and an immigration official taught me my first English word: smile. We settled in Baltimore. Both of my parents worked for Papá’s uncle, who owned a textile firm: Papá handled the company’s exports and Mamá was his assistant. My parents were sometimes bitter about having to rely on an uncle’s largesse for a job, and working directly under a cousin who was nearly 20 years my father’s junior; but they were grateful to be earning enough to buy a small house and a car. Friends and neighbors welcomed us and treated us kindly, but they knew nothing about Argentina. One kid asked me if people wore shoes in Buenos Aires. So our family devised a Cliff’s Notes version of where we came from—steak, tango, soccer—avoiding talk of Peronism and other hard-to-explain elements of Argentine life. By 1954, our connection to Argentina had withered away. The gourd my parents once used for drinking yerba mate was now used to darn socks. Seven years after arriving in the US, Mario and I spoke unaccented English and only our first names remained as a stubborn vestige of the past. It was during that year, when Mario was a senior engineering student at Johns Hopkins, that he decided he wanted to be a military officer and signed up for ROTC. One day in early 1955 there was a knock at the door. Two men in suits, after showing us their government badges, handed us papers from the Immigration and Naturalization Service, ordering us to leave the US. My parents finally sat us down and explained that we did not have proper documents. That letter written in 1947 by our family friend, the one who owned a candy company, permitted us to get visas to the US, but the visas were restrictive: only Papá could work, and only for that candy company, importing its products to the US. Mamá was not permitted to work, and neither were my brother and I. And, besides, that visa was only for two years, a period that had long passed. Whether the letter was real, or whether it was written for the purpose of getting us into the US, I don’t know. My parents borrowed money to hire an expensive lawyer, and he filed a petition that postponed our deportation. He also requested a hearing contesting the deportation order. For the next year, our lives revolved around not getting deported. We gathered supportive material, including our tax returns. My parents had always paid their taxes on time, always paid more than necessary. Even though my parents sold textiles to places abroad, during our first nine years in the US they never traveled to any of those countries. They must have been afraid that if they left the US, they wouldn’t get back in. Forms were filled out for every member of the family again and again: there was always something wrong or missing. Fees were paid to government agencies and to our lawyer. Files were lost. We waited in line. Every step was another delay. It took more than a year, but in the end we won our case. Even better, we were given the least onerous option: rather than have to go back to Argentina and then return, we were told we could go to the closest border—Canada—and re-enter as permanent residents. So in January 1956, when I was 15 and Mario 21, our family took a train from Baltimore to Buffalo, and then a bus to Niagara Falls. We spent the night in a hotel close to the falls. My parents, I could see, were pleased to be traveling, pleased to be going abroad, if only for a moment. Somehow, it reminded them of the lives they had once lived, when they were part of a diplomatic mission. In the hotel’s dining room that night, my father insisted that we order the most expensive items on the menu, as if someone else, a government, were paying for it. The next morning, the air sharp and biting, the four of us walked halfway across Rainbow Bridge to the international border post. We entered Canadian territory for no more than a few seconds, turned around and came back, showing US immigration authorities our documents. We were now legal residents of the US. In the cold light of morning, however, my parents felt that the brief period of elation they’d had the night before was over. During that train ride back to Baltimore, my parents were mostly silent and pensive, as if by returning to the textile factory, their lives hadn’t really changed. In order to survive, my parents were working at jobs they felt were beneath them. Papá, an arms expert who spent more than 20 years in a government career living and traveling outside of Argentina, had become a textile salesman. My mother, fluent in many languages, a skilled diplomatic hostess, was my father’s secretary. In Latin America, a profession is the face you present to the world. There, it’s not just medical doctors whose title becomes part of the name; it’s also lawyers, architects, engineers and others. You’re addressed by your profession, and that becomes who you are. If you had a glamorous position with the government, living for years in different parts of the world, that too becomes who you are, as it did with my parents. Mario, my brother, was aware that my parents had sacrificed a great deal in order to provide him with the opportunity to achieve success, and he did his best to honor their sacrifice. He received his engineering degree at age 20, became the youngest Professional Engineer in the state of Maryland when he was 25, and eventually started his own company, Loiederman and Associates, which grew in size and importance, specializing in developing ecologically-sensitive wetlands areas. With Mario, the eco-conscious engineer was always close to the surface. One day we walked by a stream and he noticed a tomato plant nearby. He wasn’t happy about it. “Tomato seeds go through the digestive system and come out the same way they go in,” he said. “A tomato plant means that sewage has gotten into the stream.” Mario contacted authorities to let them know. There was another aspect to Mario: his desire to help artists find venues to display their talent. In the last years of his life, this became one of his great passions. He was president of the Strathmore Hall Foundation, Chairman of the Board of Trustees of the Maryland College of Art & Design, and Chairman of the Maryland State Arts Council. His support of the arts, his community activism—he did that for his own satisfaction. In 2001 Mario died suddenly in his sleep from a heart attack. In 2005, because of all he had done, both as an entrepreneur/engineer and promoter of the arts, the A. Mario Loiederman Middle School for the Arts was named in his honor. At their first-ever graduation ceremony, I look at the students of Loiederman Middle School and wonder how many are without proper documents, as my family was. How many of these kids retain emotional ties to their native country? In his own way, Mario retained those ties, rooting for Argentina in international competitions, feeling deep empathy for Argentina’s problems. But he was also a patriotic American. He saw no conflict in that. After all, it was his patriotism, his desire to be an officer in the US Army, that led to our being caught. We were discovered precisely because Mario wanted to serve his community and his country. Given the political climate in the US these days, it’s easy to become cynical about the promise that America has always held out to immigrants, the promise embodied in the Statue of Liberty that Mario and I first saw that September day in 1947. But Mario was never cynical about that. After all, cynics don’t get public schools named after them. Roberto Loiederman has been a journalist, merchant seaman, and TV scriptwriter, has had more than 100 articles published in L.A. Times, Washington Post, Penthouse, Fifth Wednesday Journal, Serving House Journal, Santa Fe Writers Project, etc., has been nominated for Pushcart Prize in 2014 & 2015, and is co-author of The Eagle Mutiny, a nonfiction account of the only mutiny on an American ship in modern times: www.eaglemutiny.com.